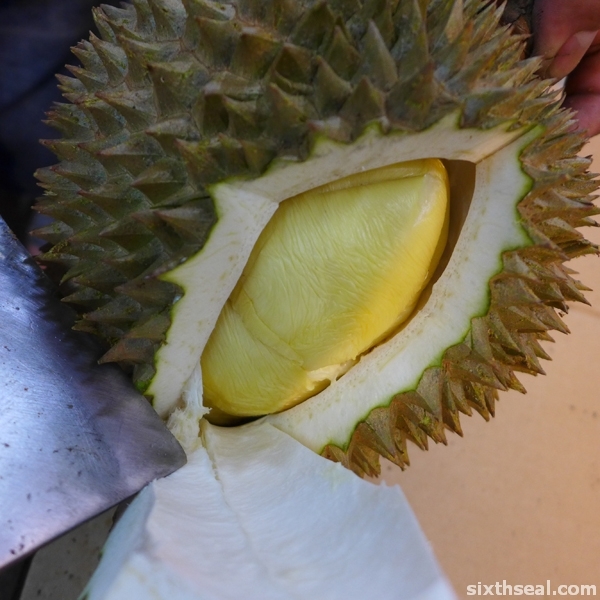 Durian Degustation – 5 great late season durians! 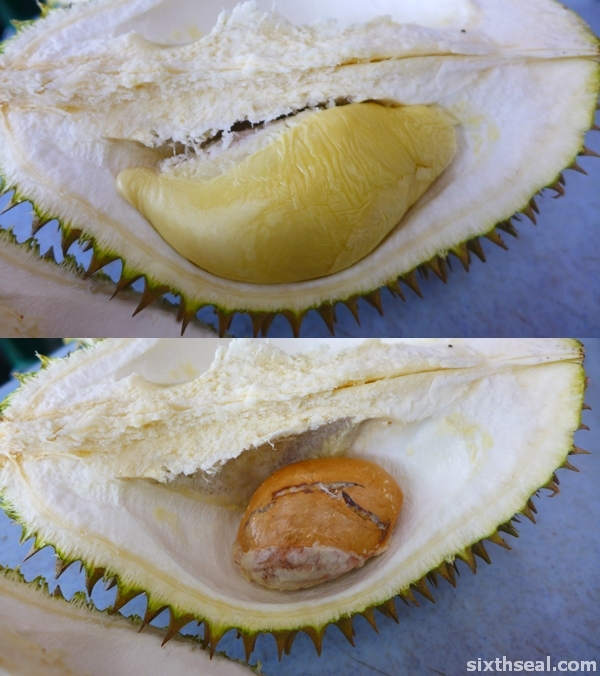 This is a rather distinctive durian that is easily identifiable from the “longkang” (drain) running down the middle of the fruit. It was purchased for RM 15 / kg and the fruits are normally medium sized. 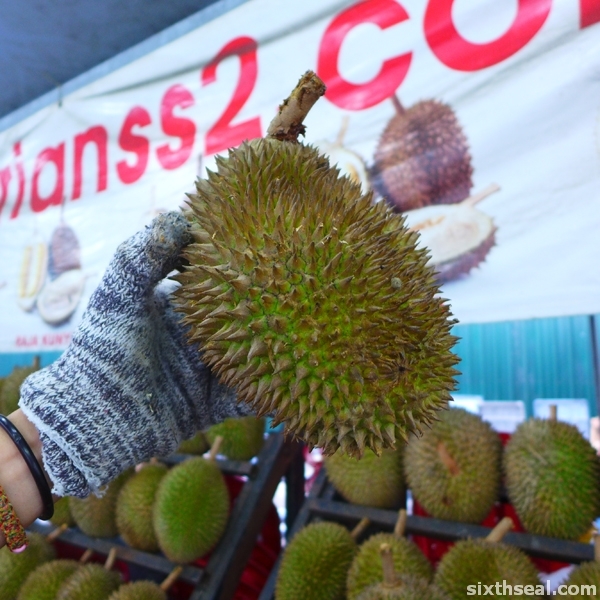 This particular durian weighs 2.1 kg – about the average for this cultivar, making it over RM 30. 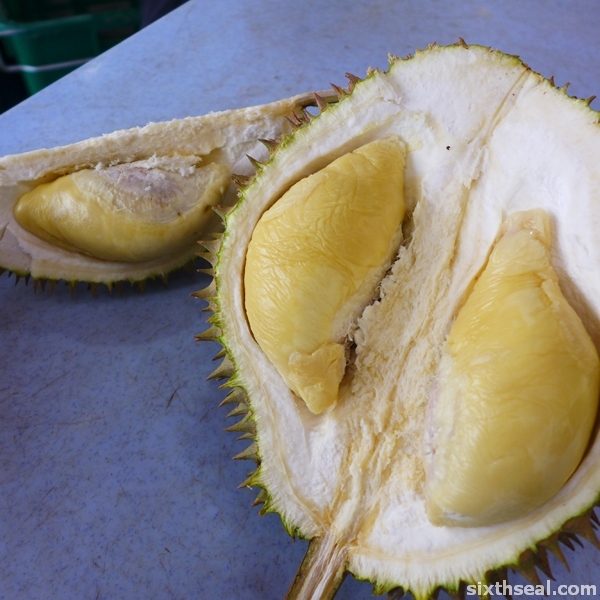 There are only 10 seeds in the durian, which translates to about RM 3 per seed. The seeds are tooth shaped – these come from Pahang and there are regional differences when planted in different locations. The Teka in the market now are delicious sweet to bittersweet specimens, but rather expensive – the original listed price is RM 18 / kg. It does have a very high flesh to seed ratio though. 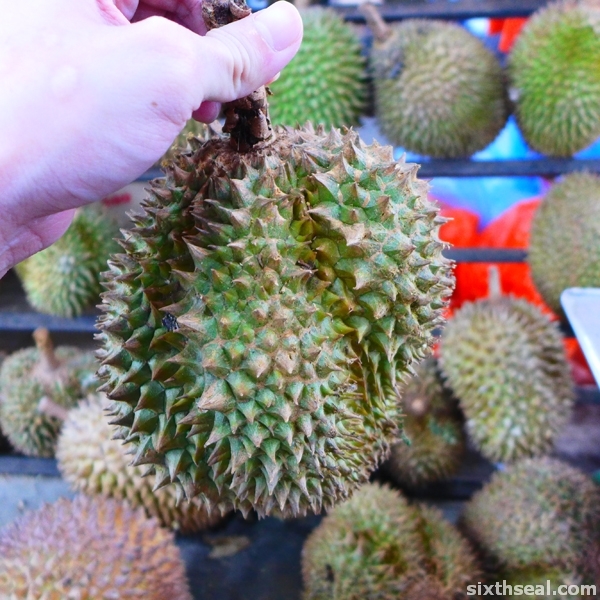 Look at the unique shape of the durian! It’s a star-shaped durian with 5 sides like a durian I came across not too long ago. These are not the original Balik Papan, Penang Red Prawn durians but cultivars that has been transplanted in…Pahang. It’s where we get most of our durians here. 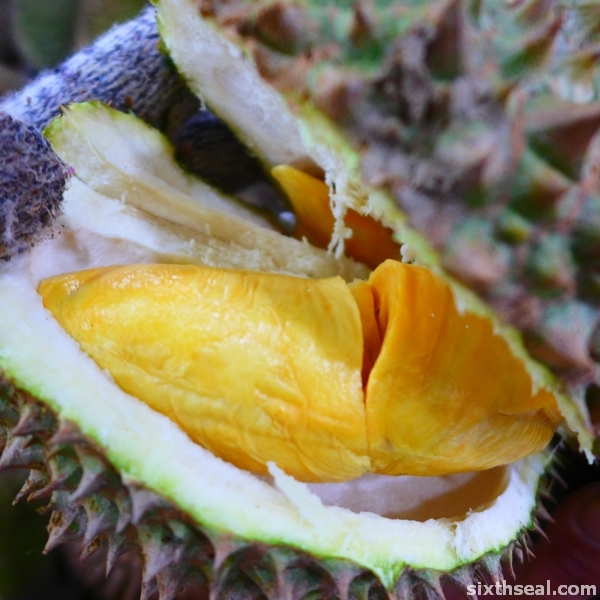 The flesh is orange to reddish, the distinctive color that gives the durian it’s name. I got it at a great time – RM 11 / kg and it’s absolutely fabulous with tiny seeds. These Pahang Ang Heh really tastes good but the drops are irregular so it’s hard to come by. I’ve only had it three times this season. This is a popular durian – sweet and creamy. The 1.6 kg fruit we chose is sold at RM 14 / kg. There’s only five (5) seeds inside so that works out to about RM 4.50 per seed. 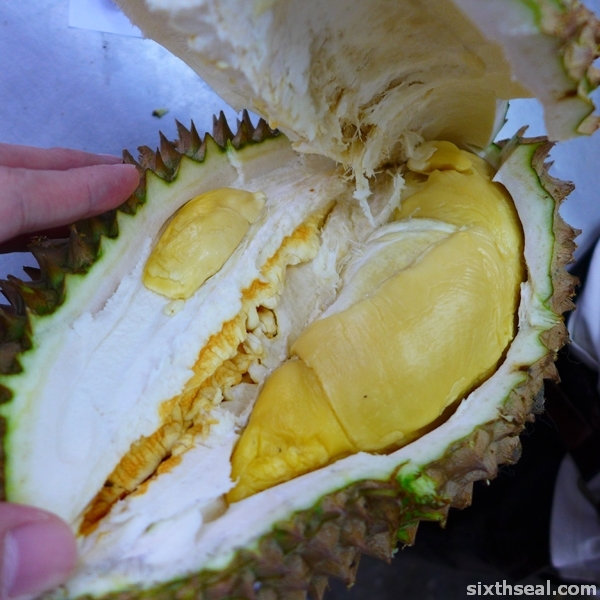 It’s not a durian with a very complex flavor profile. This is named after a gourd – the words “hor lor” actually means water gourd. It’s a Northern durian but the ones we get are from Pahang. It’s listed as RM 15 / kg but managed to get it at RM 14 / kg. It’s also a medium sized fruit, got a 2kg + durian for RM 33. 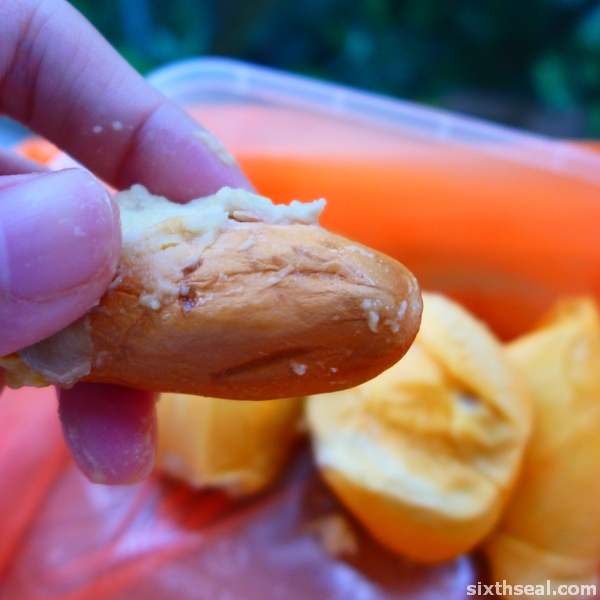 Holo is great for those people who likes a dry, bittersweet, creamy and sticky durian with medium seeds that coats the palate and tongue like nothing else. Highly recommended. This is an absolute bargain at RM 6 / kg. I had a 2.1 kg fruit for just RM 12. The Kan Yao we get here is also from Pahang and it’s bitter to bittersweet, just the way I like it. Gosh!!! You’ve eaten more durian than what I’ve eaten my whole lifetime! LOL!!! Not really a fan but I love durian desserts. I had a couple of late season D88 and D101 but those are nothing to write home about. I’m not particularly fond of D88 but they had quite a fall that day. RM 15 / kg. I love to eat durian too..
last time I eat the musang king first then eat those normal duriam..
Great tip for people new to durians though. Always eat from mild to strong flavor profile. Cheers mate! 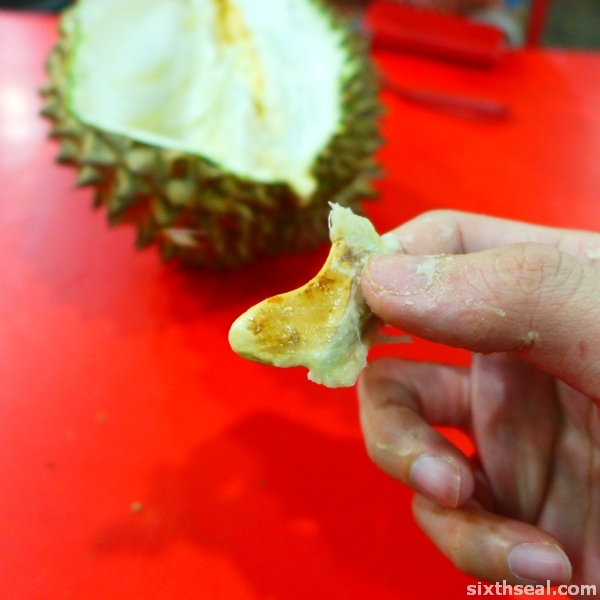 I’ve loved durians since my first taste as a kid. I might have – been swimming more nowadays. Heh. Some people who sees me says I have but others who hasn’t seen me for close to a year says I’ve *gained* weight. Dude,,,,,,,,,,,,,,,dang it, I’ve never been home during Durian season. You can get durians anytime of the year nowadays. You’re definitely a bigger durian fan than me. I like to eat durians too, but only on occasions. There are reasons behind my decision, but one of it includes Big Fat, who demands that I share the portion with him. I’m sick now – am down with a nasty bout of the flu so maybe that explains why I’ll be a bit thinner. Haven’t been sick in a while so it’s hitting me real hard. It’s mostly kampong durians and if you’re lucky, you get some really great ones. I just can’t stop looking at your durian post. It really makes me drooling now. 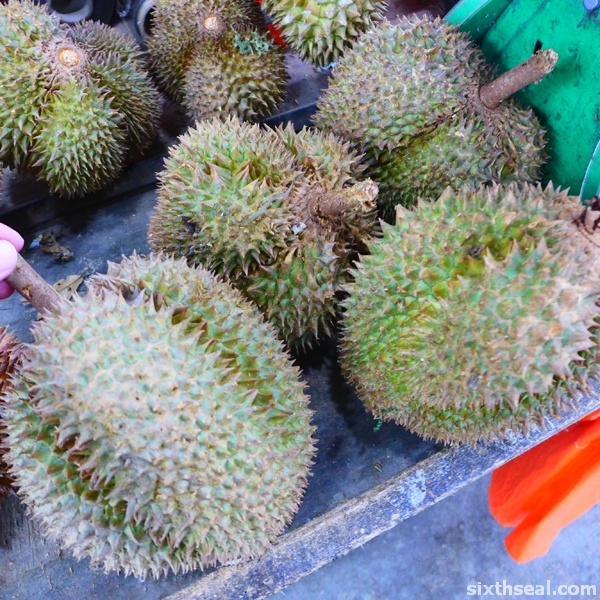 The season is so over now and I’m looking forward for the coming durian season in June! Yummeh! It’s durian season all year over here. Haha! Well, you can get them the entire year but cheapest and best would be around June. I had my first Teka durian in Dec. 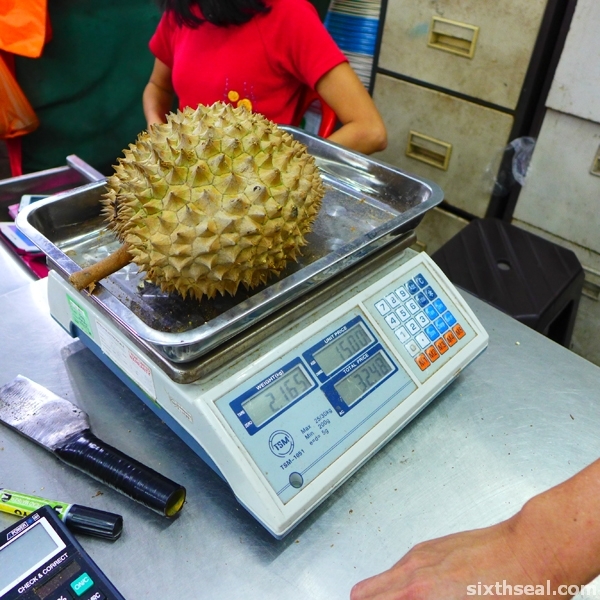 It was a huge durian, nearly 2.5kg. I didn’t regret paying for it because the flesh was really thick and came with a tiny seed. I was so satisfied. Good thing that the seller insisted that I try Teka as he ran out of Musang King. Btw, where do you usually get your durian? 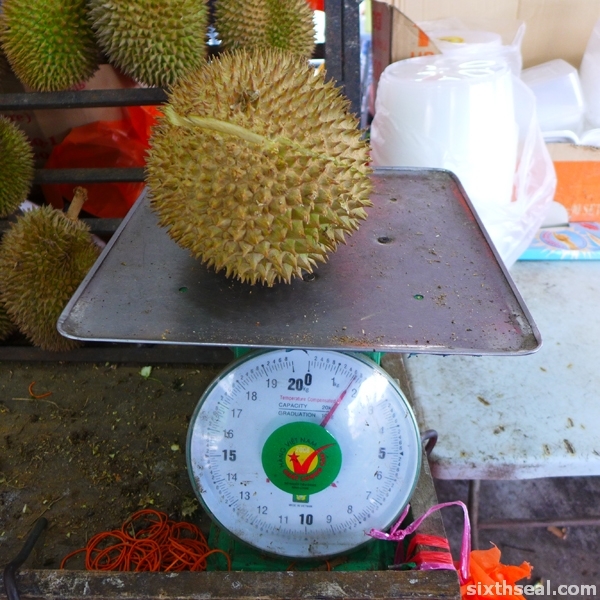 Yup, Teka durians are large durians – usually about 2 kg+, I haven’t seen any under 2 kg yet. It’s the characteristics of the durian that makes it so huge. The Teka that we get can have small seeds too, but after seeing the really small seeds of breeds like Jantung, I’ll call them medium to large. Haha! I’m a bit wary of Musang King coz every seller pushes it and I don’t like it as much – too much hype, not enough performance. Black Thorn is surprisingly good though – it retails for RM 30 / kg, much more expensive than Musang King (usually around RM 24 / kg). Relatively new cultivar from Penang. Durian buffet eh? 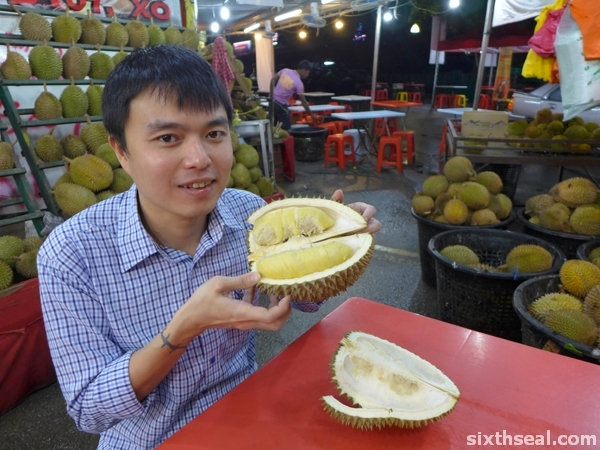 Go for the more expensive RM 15 ones – at least you’ll get “pedigree” durians like XO etc. I have not been eating durian for some time now. I always got sore throat and a heaty body in durian season. Guess not much fate with the king of fruits! Alas! Sorry to hear that buddy! Oh well, it’s durian season whole year round anyway. How can someone as skinny as you eat so much durian!! You can see my fat when I swim, it’s just distributed along my width and my face (usually). 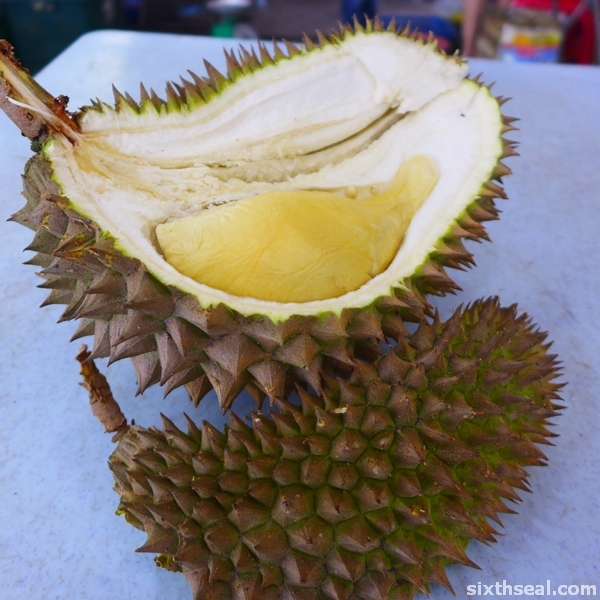 I don’t know about the durian thing – I can eat A LOT of durians and not get fat. I don’t know why, it’s just like I can drink a lot of milk (fresh) and not get fat too but if I eat a lot of sugar, I’ll get fat. I don’t metabolize sugar well. wahhhh i love durians too. Please call me whenever you feel like feasting on durians again! My mom loves it too and I’ve always like those with an orangey flesh. Crap! I just went, I forgot to call you! It’s a new cultivar called Black Thorn. I’ll go again, it’s in season right about now. Let me know when you want to go. Where is the place that you had your durians fit the pictures of durians look smashing at their stand. Care to share eer… GPS location if possible.